Hi, I am a ESL English Teacher student from México. My name is Diana López. I work a part time in a kindergarten. I really like the English language i learned when I was living in United States, my biggest wish is to come back and work as an English and Spanish teacher. This worksheet if very helpful to Spanish learners students. Thst´s why I put the pronuntiation. In this game the children learn to write the colors name. This game is perfect for you! 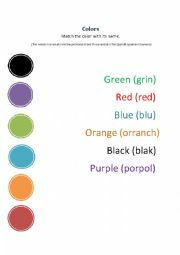 Now you can name the colors.